Leicester City boss Nigel Pearson insists he isn't worried about his future despite the Foxes sitting bottom of the Premier League. 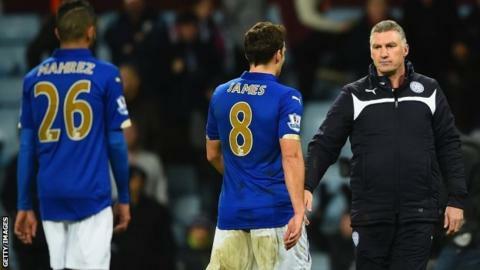 Sunday's 2-1 defeat at Aston Villa stretched the newly promoted side's winless league run to 10 matches. Pearson said: "I can't afford to worry about my own position. That would be a negative influence on how I work." Speaking to Sky Sports, he added: "I still have a lot of belief in them and likewise they are behind the staff." "Football remains a business in which margins are small and, let us face it, most managers in this game - and certainly this division - have felt the heat in terms of pressure to get results." Foxes goalkeeper Kasper Schmeichel told Sky Sports the players are still "100%" behind Pearson. City, now four points from safety, took the lead at Villa Park through Leonardo Ulloa but were condemned to a seventh defeat in eight games by goals from Ciaran Clark and Alan Hutton. "There is no getting away from how difficult it is because the run is so poor, and the players are very down today," said Pearson. "They are hurting but they are a good group of people, we have to make our own breaks. "It remains for us all to be prepared to continue to work hard and stretch each other. We have to remain resilient mentally. "You can see our players are committed and do care. My job is to protect my players and to lead them, which I intend to do. "I do appreciate the fans' frustration and I really hope they stick with the side." Visiting defender Paul Konchesky received a straight red card late on to complete a miserable week for Pearson, who refused to say sorry over a row with a fan after Tuesday's 3-1 Premier League defeat by Liverpool. Aston Villa defender Hutton squared up to the Leicester full-back after an 80th-minute challenge but, while the Scot escaped with a yellow card, Konchesky was dismissed. "We were under the impression it was for the initial challenge, but now we think it is for the coming together of heads," said Pearson. "He is not the instigator of that. The prudent thing for me is to wait for the report."